Rafael Nadal, right, shakes hands with Roger Federer after their semifinal match at the 2014 Australian Open. Rafael Nadal, right, shakes hands with Roger Federer after winning their semifinal match at the 2014 Australian Open. Over the next few days, Rafael Nadal will attempt to win his ninth French Open and become only the third male player to achieve 14 major championships, tying Pete Sampras and moving within three of Roger Federer’s record of 17. He’d be the first to win a particular major nine times, and, at barely 28 years old, he’d be just shy of Federer’s pace in reaching the milestone (Federer won his 14th major at 27 years, 10 months). Federer, now 32, may or may not have another major in him. Tennis is a young man’s game — much more so than many other sports. In golf, for example, many players don’t win their first major until their 30s; since 2009, the PGA has seen 13 of 21 majors won by players 30 and older (and three were over 40). In football, quarterbacks have played well deep into their 30s — Peyton Manning (38) and Tom Brady (37) are still among the best in their sport. In tennis, however, many legends were done winning Grand Slam events by their mid-20s — Boris Becker’s last of six was at age 28. Mats Wilander won his seventh and final major at 24. John McEnroe (7) and Björn Borg (11) were done at 25. Even Jimmy Connors (8), famed for his longevity — he made his famous run to the semis at the U.S. Open in 1991 at age 39 — won his final major, the 1983 U.S. Open, at 31. The aging curve for men’s tennis does appear to have shifted in the past few years, with more 30-somethings on tour remaining in contention.1 There are currently two top 10 players in their 30s — Federer and David Ferrer, both 32. Their presence has helped skew the average age of a top 10 player to its highest point since the early 1970s. Although Federer’s presence in the top 10 is a reflection of his great career, Ferrer’s ranking is a bit of an anomaly. But he still hasn’t won a major, and if he dips from the top 10, the group’s average age will quickly move closer to the normal range. Connors hung around in the top 10 until he was 36, but he was done winning majors at 31. It may be possible to play at a top-10 level into one’s 30s, but the majors — with best-of-five set matches versus the best-of-three format on the typical tourney — more rigorously test not just the skill of the player, but also his endurance. Empirically speaking, players in their 20s still tend to win these events — since 2000, a player over 30 has won a major only four times: Andre Agassi twice (30 and 32), Sampras (31) and Federer (30). So with Rafa turning 28 on Tuesday, is he a sure thing to equal or surpass Federer’s 17 titles? How likely is Fed to win any more? By analyzing the full data set of champions by age during the Open era, starting at the French Open of 1968, we can show the ascent, plateau and drop-off in performance as players mature and decline. Building upon this, we can make some predictions about how Nadal and Federer will perform over the remainder of their careers. Note the drop-off as players enter their 30s. Only 10.3 percent of majors have been won after age 29 and a mere 3.3 percent after age 31. In tennis, the “wrong side of 30” is a harsh place to be. If we consider only retired players (keeping active players skews the distribution younger), the mean champion age is 25.16.3 This places Nadal nearly three years past his prime. And Federer is ancient at 32! The only players older than Federer to win a major were Andrés Gimeno, who won the 1972 French Open at 34, and the ageless Ken Rosewall, who won majors at 33 (’68 French), 35 (’70 U.S.), 36 (’71 Australian) and 37 (’72 Australian). Agassi won the 2003 Aussie just shy of Federer’s age (32 years, 9 months). With only six of 184 titles won by players 32 or older since 1968, it’s clear that Federer’s window is closing fast. So, who finishes with more hardware? Let’s first determine how good each player is relative to prior champions at their respective ages. We’ll determine a player’s age-adjusted performance ratio as the number of championships won through his age divided by the majors won by the average champion. For example, through age 27, Nadal has won 13 majors, while the average champion that age had won 2.43.4 Dividing Nadal’s wins by this average, we get a performance ratio of 5.35. To determine the expected additional titles we’d expect Nadal to win, we can take the product of this multiplier and the average champ’s wins after age 28 — 0.65 — for a total of 3.48, yielding Nadal a projected total of 16.48 titles, just a tad bit short of Roger’s current 17. We can use the same methodology to calculate Federer’s total projected career majors. With two of the season’s four majors remaining before his 33rd birthday, we’ll declare him as effectively 32.5 years old. We’ll take his 17 titles divided by the 2.96 won by the average champ through age 32.5 to get a performance ratio of 5.74. As the average player can expect 0.13 majors won after 32.5, Federer’s projected career titles is 17 + (5.74 * 0.13) = 17.75. To determine the likelihood Nadal passes Fed, we’ll need to determine the range of championships he’s likely to win. We can use the binomial theorem5 to help us. During the Open era, winners have ranged from age 17 to 37. Hence, based on the age curve, Nadal has 10 years left at championship contention level. With four tourneys per year, he’s got 40 remaining opportunities to win. As we saw earlier, the average retired champ won 0.65 titles from 28 on, reflecting a win probability per tourney of 1.63 percent. Multiplying by Rafa’s performance ratio, 5.34, we can speculate that his odds of winning are about 8.7 percent per tourney. If we want to calculate his odds of attaining, for example, three additional majors, we can plug these numbers into the binomial model to get the odds. In this case, Nadal has a 22.61 percent chance of finishing with precisely 17 titles. The table below summarizes the potential outcomes based on this model. The outside cells represent the probabilities of each player finishing his career with a particular number of championships. 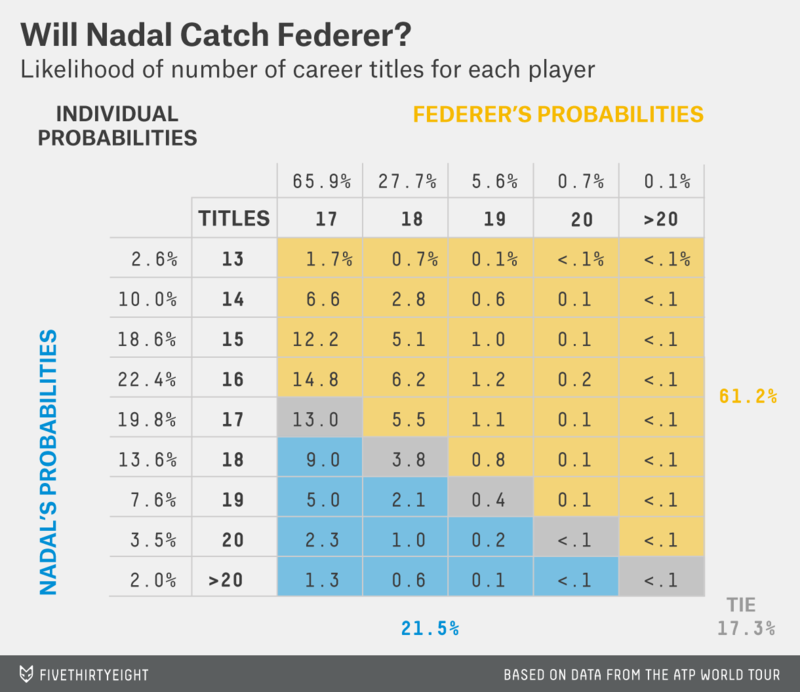 Nadal’s probabilities are listed in the rows on the right, while Federer’s are represented horizontally along the top. The cells in the center represent the joint probabilities of the varied individual outcomes. Cells in yellow represent the status quo — that Federer remains ahead — while the gray cells represent a tie, and the blue cells indicate Nadal passing Federer. The odds of Nadal finishing at precisely 16 titles and Federer at 17 are a little under 15 percent. That’s also the most probable of the individual scenarios. Overall, there’s about a 61 percent chance that Federer ends his career ahead of Nadal, and about a 17 percent chance they end in a tie. It looks like somewhat of a long shot for Nadal to pass Federer (close to a 22 percent chance), but if he were to have a strong summer and win two of the three majors remaining in 2014, he’d greatly improve his chances. Then again, failing to win even the French would be a serious blow — especially if Federer could pull off another win this year. This French Open, along with the remaining majors this year, will tell us a lot about who eventually ends up atop the leaderboard. The conversation as to who’s the greatest of all time doesn’t end there, of course. It probably starts there, though, and whoever of these two ends up on top is likely to hold that title for many years to come. I gathered age data on the top 10 players by year and track their average age, going back as far as possible, to 1973. The ATP’s website provided me with birthdate data, and Tennis28.com tracks year-end rankings. This data set reflects 184 events won by 47 different players. The aging profiles for both Nadal and Federer have closely paralleled the typical one. 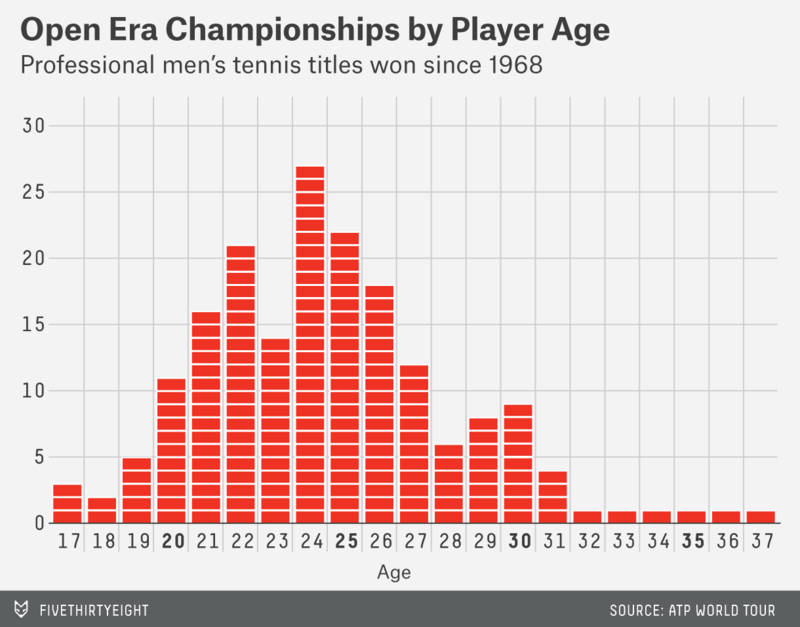 We can see this by combining their grand slam titles and looking at the distribution by age. Using their exact ages upon winning, this works out to an average age of 24.57 for a title win, a little below the retired champion average of 25.16, with room to increase if either win subsequent titles. All figures here are rounded to two places of significance, but the full numbers were used in the calculations. The result is the same. The binomial theorem is a powerful tool used for calculating the probability of k events occurring over N trials, given the probability, p, of success in a single trial. It allows us to take, for example, Nadal’s future probability of winning k = 3 additional tournaments over N = 40 trials (10 years at championship level times 4 tourneys per year), given that he has an average probability of winning p = 8.55 percent of tournaments entered. This yields a probability, P, of 22.61 percent. Further reading on binomial distributions can be found here. A binomial calculator can be found at Stattrek. John Ryle is a financial software developer, sports fan and data enthusiast from Boston.